The “How Did You Die?” Show is not a show about death, but very much a show about life. These are not descriptions of literal deaths caused by a heartbreaking bodily disease or a tragic road accident, but are examples of the small, metaphorical deaths that human beings experience each day; the cemetery images merely add a beautiful aesthetic. Often whispered between two confused looking people, artist and author Lisa-Scarlett Cruji regularly overheard this question in her art tent at the outdoor shows. She would normally only volunteer the succinct, “I travel all over North America and a little beyond, take photos in public cemeteries, and then write a fictional story about how a person died.” This explanation was usually met with satisfied nods and curious expressions. A great number of very generous visitors told her that they felt these images should appear in book form, allowing for a more comfortable and leisurely read than they were sometimes subjected to at an outdoor show. Rain, soaring humidity, and dense crowds could rather impede the extended reading that The “How Did You Die?” Show required. In this book form, with the reader hopefully far more relaxed and not up against the elements, Ms. Cruji would like to give you an extended introduction to the essence of this show. And I died because of the thought that i cant find enough word to describe this book.ıt is very creative art piece,Topic is very interesting concept.The book not only takes you to a cemetery visit but also makes you caught in a conversation with ghosts.Tales are a bit saddening,heart breaking but quite true and honest about life.Book makes you think about that life is not guaranteed and can be easily taken out with smallest details we dont recognize.There are some stories about suicide also.These show us that we sometimes dont realize somebody is standing on last step to end his/her life.We make them prove that they cant bear anymore.Also,photos are well-taken,chosen and they touch your heart directly.These make you question about how are not aware of worthy life we have been given till last breath.The book is mind-opening,touching.It is able to change you and the way you perceive death.I suggest you to read this book and check photos including.Five stars from a ghost reader. 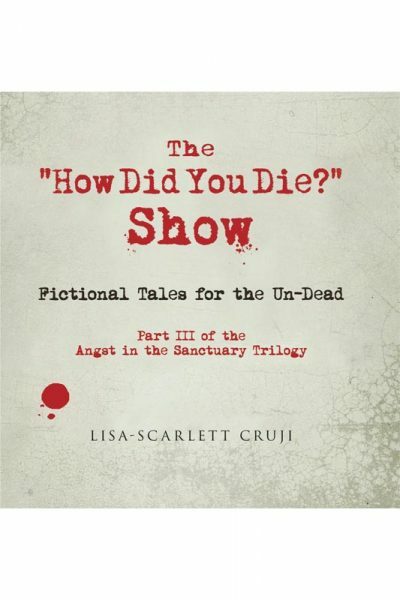 I love Lisa-Scarlett Cruji’s book “The ‘How Did You Die?’ Show (Angst in the Sanctuary)”, both the idea and the execution (pardon the pun). What a simple, yet compelling idea: you see a grave stone, and with no more information than marker and name, ask “How?” The images are haunting (this time it is intended); they look like Polaroid transfers, and they capture both the beauty and the macabre in death and dying. The stories—the short, pithy explanations that describe the “how” in each death—are typewritten, not word processed; these stories are human, not digital. Timeless, not fleeting. And the “how” is not as in the physical steps required, but rather the “how” in the emotional and spiritual trauma that created the moment of action. The knife, the drowning, the plunge, the car crash—however we will die, it is often not the act, but the events that are the story. I love this book, and if it looks this good on my Kindle, I bet it’s spectacular in print. As it turns out one can experience two deaths: a metaphorical one as well as the inevitable physical ending. The “How Did You Die” Show is a creative piece. Unusual to say the least, I found it to be interesting. There are at least two approaches one might use to ‘read’ this work. It can be literally plowed through in half an hour but to gain full value I suggest the reader absorb a few of the cemetery images and their contents at a time and in doing so revisit this creative adventure on a number of occasions. The contents evoke a wide range of intellectual and emotional response. It is sad, it’s funny, it’s profound. The “How Did You Die” Show is different but different can be good and in my opinion I believe that is exactly what The “How Did You Die” Show is. Enjoy. An interesting premise that I wasn’t sure I would like, but once I got into it, it reminded me of my wanderings through a cemetery, where I learned about prejudice: one family’s members were clustered OUTSIDE the fence surrounding the other passed on loved ones. But no one in the town would tell me why! This story opens up questions and even provides speculative answers that I found both funny and revealing. A nice read. Very funny, perceptive book with an intriguing concept. I thought this was a very funny book and concept. Admit it, how many of you haven’t walked through a cemetery and wondered about the people buried there? The photos are appropriately spooky but the little bios are mostly funny, okay, some are sad. I loved this book. I found this book to be fascinating. An interesting look at the things in our lives that … well … just might kill us. Photos of cemeteries that have been “aged” combine with short blurbs about a person who may be resting beneath the stones or statues to give us views that are sometimes funny, poignant, sad or twisted. Get it and have a look for yourself.